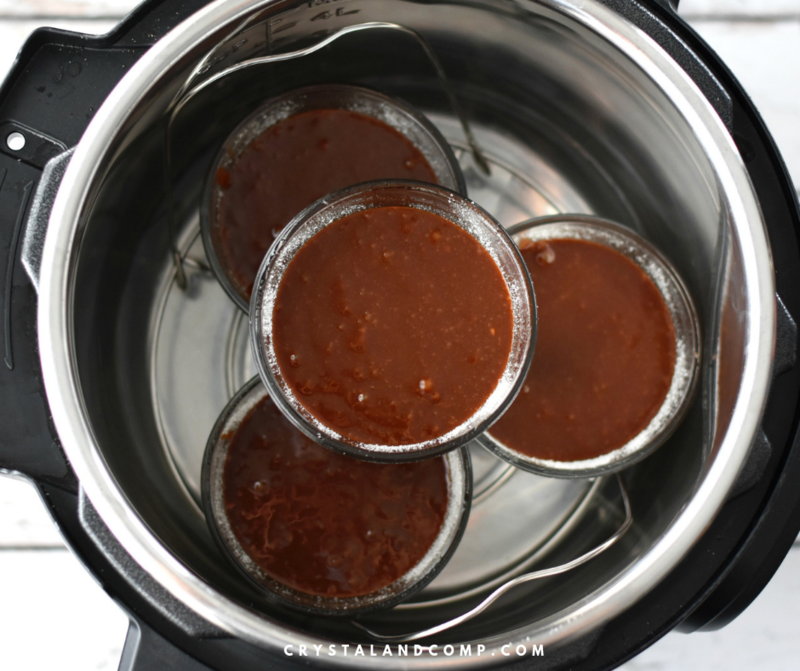 Most people do not know you can make Instant Pot desserts in your pressure cooker. We love lava cake. It is a favorite at our house. 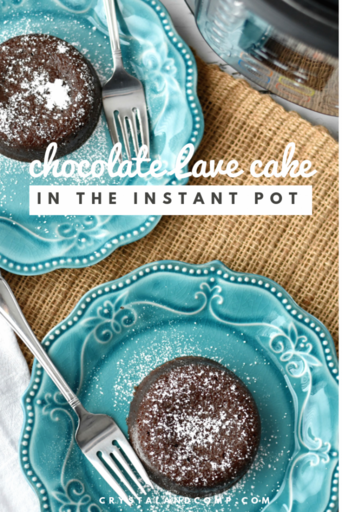 Let me show you just how easy it is to make Instant Pot Chocolate Lava Cake. You will love it! 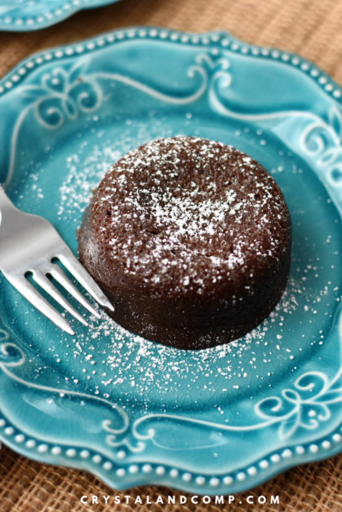 This recipe tells you how to make four individual lava cakes using ramekins. This recipes tells you how to make them in your 6qt pressure cooker. I also have an 8 qt Instant Pot. I am going to share a trick you with below for stacking more than four ramekins if you’re using an 8 qt pressure cooker. 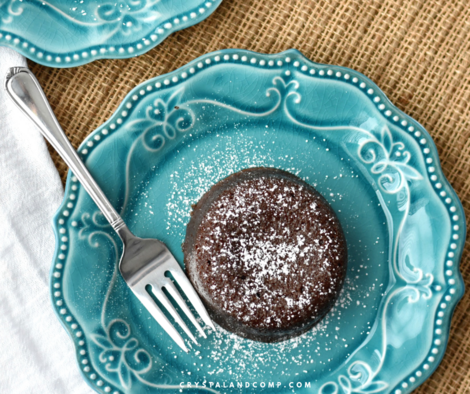 Lava cake is a dessert that combines a creamy chocolate center with a flourless chocolate cake. Many popular US restaurants offer it as a dessert but you can make it at home a variety of ways. It is also referred to as Molten Chocolate Cake, or Chocolate Moelleux. A popular way to serve chocolate lava cake is with a scoop of vanilla ice cream. The hot melting cake center mixed with the cold ice cream is a delicious dessert that many people love! First you want to grease four 6-8oz ramekins and coat with powdered sugar and set aside. 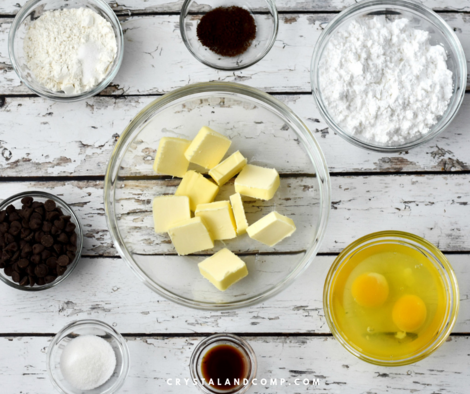 Melt the butter and chocolate in a microwave safe bowl for 1 minute. Stir and repeat every 15 seconds until chocolate is melted and smooth. Don’t go too long in between checking it when heating it up or it can harden and you will have to pitch it. Whisk in eggs and yolks, coffee, and vanilla. If you’re not a coffee fan you can certainly omit the coffee. Totally up to you. Spoon equally into ramekins and cover with foil. Pour 2 cups of water into Instant Pot liner and add trivet to the bottom. Place 3 ramekins on the trivet and stack the 4th on top. If you want to stack more than this and you’re using an 8 qt, this Instant Pot egg rack would be the perfect solution! Lock Instant Pot lid and set vent to sealing. Select Manual/Pressure Cook for 7-9 minutes. Yep, these sweet treat cook super fast in the electric pressure cooker. When Instant Pot countdown finishes, release pressure completely using the quick release. Remove ramekins carefully(they will be hot). When you go to remove them from the ramekins you might need to gently use a knife around the edges. Or, you could use a silicone spatula. 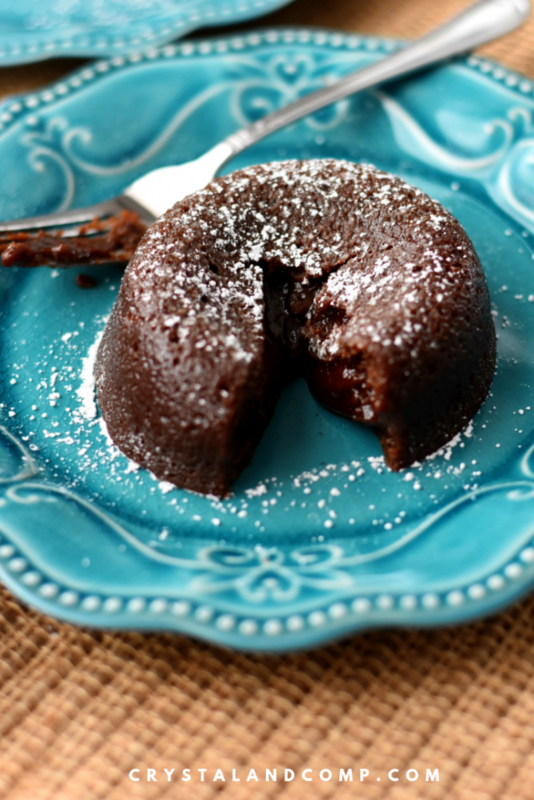 Can You Make Lava Cake in the Slow Cooker? Did you know you can also make this in the slow cooker? This is one way to make it as a whole cake and not use ramekins. Here is my Crockpot Lava Cake recipe. So good! This is a great way to make it ahead of time and take to a potluck! Can Lava Cakes Be Reheated? You can. Any cake that is not eaten after you make them, leave it in the ramekin and cover it in foil. Keep it in the fridge for five to seven days. It’s sugar… so already has lots of preservatives. Reheat the ramekins in the microwave in 15 second increments until it is heated thoroughly. Once heated, dust the top with powered sugar. Grease four 6-8oz ramekins and coat with sugar and set aside. 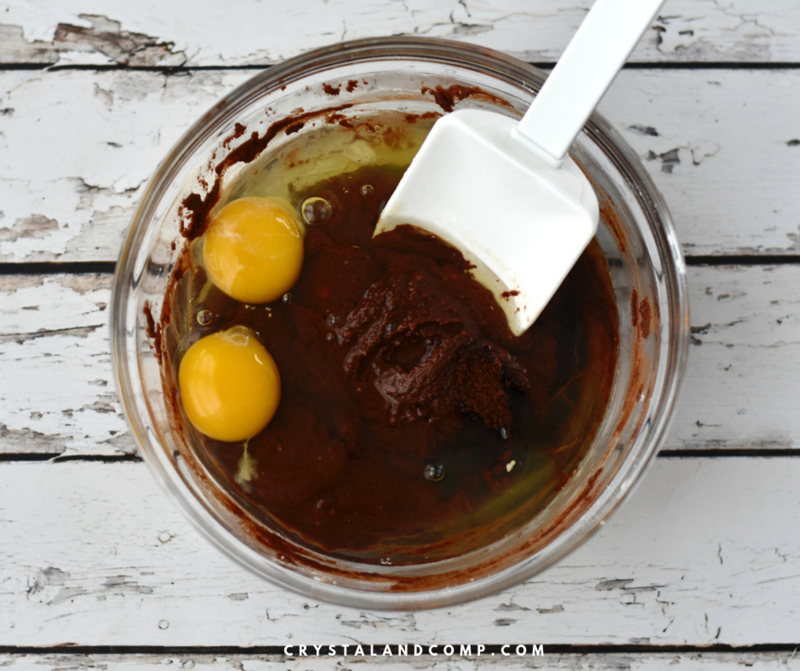 Melt the chocolate and butter in a microwave safe bowl for 1 minute. Stire and repeat every 15 seconds until chocolate is melted and smooth. Select Manual/Pressure Cook for 7-9 minutes. When Instant Pot countdown finishes, release pressure completely.